The structures below are IN STOCK and ready for delivery! Don't see what you're looking for? Let us know what you have in mind and your budget. We'll help you custom design your dream cabin, big or small! Choose an unfinished interior and do it yourself, or let us finish it for you. If you can dream it, we can build it! See some of our standard cabin options here. Click on any image to view more information about the structure, including price (freight on buyer). 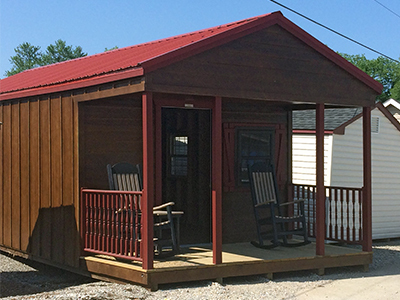 Please note: Our Rent-To-Own program is not available on buildings for residential use, including cabins. This two-story unit includes a metal roof, insulated windows, door with windows and house lock, and a built-in stairway leading from first to second floor. Click here to see full listing, price, & more photos. This two-story unit includes a metal roof, 6' porch, an insulated floor, insulated windows, two doors with windows and house locks, and a built-in stairway leading from first to second floor. This unit includes a 6' porch, metal roof with insulation, full eave vents, insulated windows, door with windows and house lock, and upgrade to 2x6 floor joists. Click here to full listing, price, & more photos. This unit includes a 6' porch with railing (creating a loft space inside), metal roof with full ridgevent, full eave vents, and door with windows and house lock. This unit includes a metal roof, 6' porch creating a loft space inside, full vented eaves, full ridge vent, an insulated floor, insulated windows, and door with windows and house lock. This unit includes a 6' porch creating a loft space inside, metal roof with full ridgevent and insulation, full eave vents, 2x6 Floor Joists, insulated floor, insulated windows, and door with windows and house lock. This unit includes a front overhang, a 4' porch creating a loft space inside, full vented eaves, full ridge vent, insulated windows, and door with windows and house lock. This unit includes a 6' porch with railing, shingle-over ridge vent, full eave vents, insulated floor, insulated windows, and door with windows and house lock. This cabin also includes an electical package including 4 lights, 6 recepticles, 2 switches and a panel box! This unit includes a 6' porch creating a loft space inside, full vented eaves, full ridge vent, insulated floor, insulated roof, insulated windows, and door with windows and house lock. This unit includes a 6' porch with railing creating a loft space inside, full ridge vent, insulated windows with 'Z' shutters, and doors with windows and house lock. This unit includes a 6' porch creating a loft space inside, a metal roof, a ridge vent, insulated windows with 'Z' shutters, and a door with windows and house lock. The interior is not fully finished but we framed out a back room for you already! Perfect for the Do-It-Yourselfer! This unit includes a 6' porch with railing, a ridge vent, vented eaves, insulated windows with 'Z' shutters, a door with windows and house lock, and LP Board 'N' Batten Siding. A storage shed can easily become a cabin with just a few upgrades! Cabins are custom built for you, so you can specify exactly the options you need. Whether you are looking for a basic cabin shell or something a little more sophisticated, just bring us your ideas! We will help you create that special place of your own. We have multiple siding options in a variety of colors. It's your cabin after all, so the choice is up to you! Designed by hunters, for hunters. 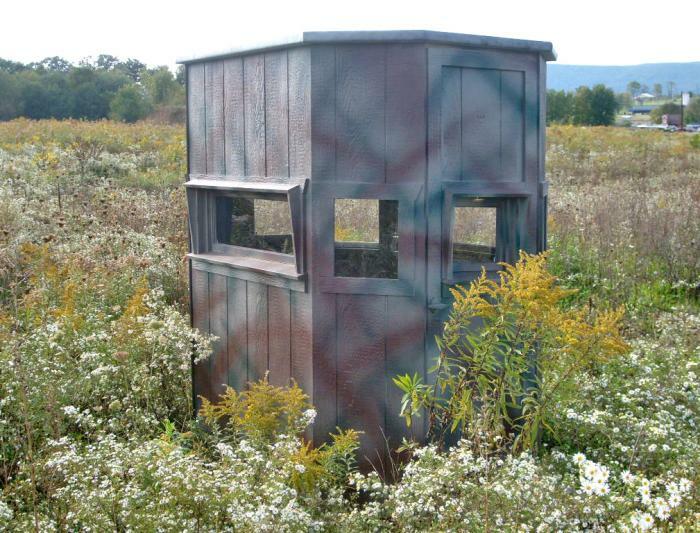 Pine Creek Structures' Wylde Series are hunting blinds that have got you covered! 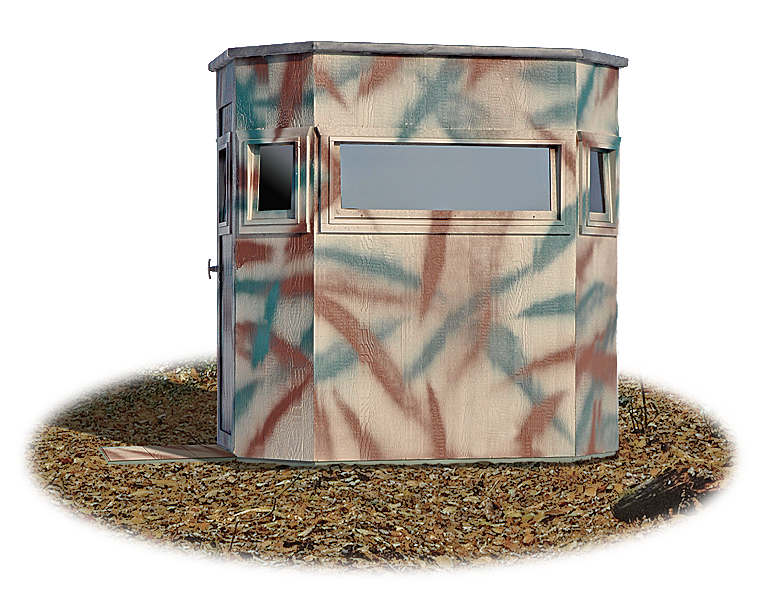 All models are available prefabricated and ready to hunt in or in kit form. Just grab your coffee, lunch box, and a small heater and you're set for an all-day hunt. While your buddies are back at camp trying to get warm and dry, you can be taking advantage of extra hunting hours in any weather. The 4'x6' area easily fits two chairs. This is a great way to spend time with youth or senior hunters! The oval design of our blinds is a result of years of experimenting with different blind designs. Unlike square blinds, our oval shape gives you a 360 degree view with minimal movementThe window height is just right for a comfortable lawn chair, so you can sit and watch all day long. We even designed a special slide-down window system to eliminate movement in front of the window while opening… More more getting busted at the moment of truth! 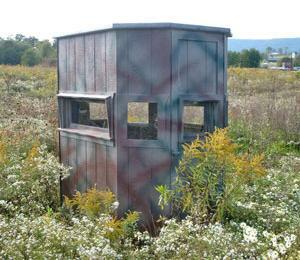 Have your own ideas about what your hunting blind or deer stand should look like? Call or stop into a location nearby and talk to a sales manager. We'll help you design a one-of-a-kind blind just for you! Click any of the images below to view larger! 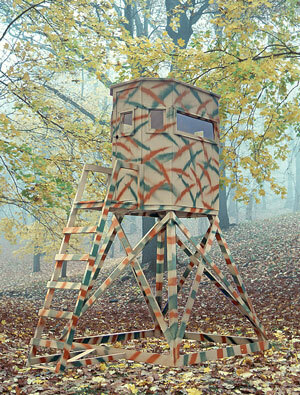 Finally a tower stand that is completely designed with the hunter in mind! 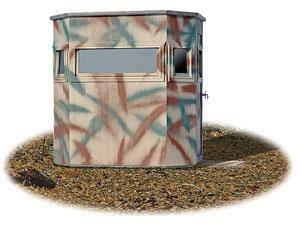 Looking for an enclosed tower stand? Check out our Hideaway model. It's elevated 8-feet off the ground. You not only get to stay high and dry; you also get a 360 degree view of your surroundings, thanks to our unique and virtually silent window system. Being comfortable all day will help you to stay focused longer, and you’ll truly discover what “Wylde” treasures your property holds! The Ambush utilizes the same function to form styling that is found in all our Wylde Series models. Designed with the price conscious hunter in mind (without sacrificing quality in any way), this a base model that can easily be upgraded to the Hideaway model later. 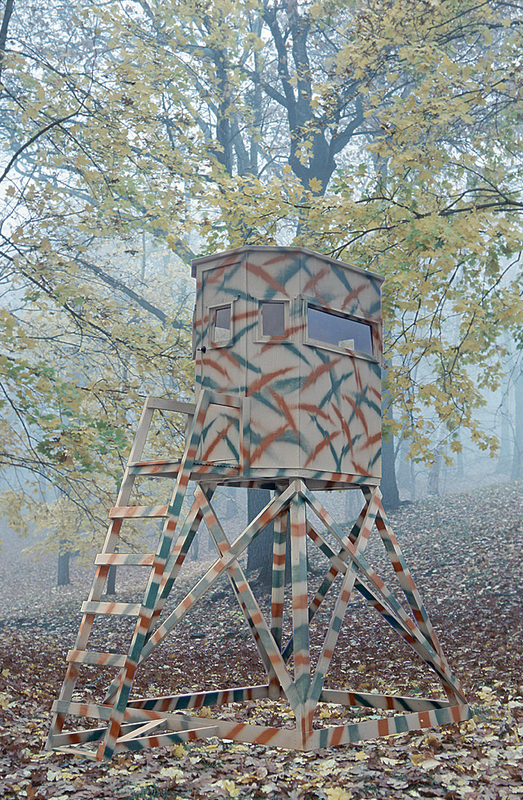 Based on what our Canadian friends have been using successfully for years, the Ambush is perfect for areas where a traditional tower stand may not be suited for. Sun-Mar toilets are the safest and most environmentally friendly method of waste treatment. These composting toilets evaporate liquids and compost the solids, so on most models there is absolutely no output and no contamination of ground water. Sun-Mar composting toilets have saved over 3.3 billion gallons of water and counting! 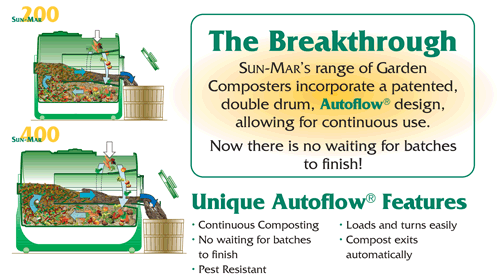 Sun-Mar is a world leader in composting toilet technology with a unique, patented Bio-drum™ design that means fast, odor-free composting. Sun-Mar toilets are the only ones certified by NSF to NSF/ANSI Standard #41 for residential and cottage use (most regulators require NSF certification). They're designed so air is constantly being drawn in and up the vent stack providing odor-free operation. Sun-Mar’s unique 3 chamber technology means easy operation and maintenance. Composting converts organic matter back to its essential minerals. Aerobic microbes do this in the presence of moisture and air, by converting carbon to carbon dioxide gas, and hydrogen to water vapor. As a result, some 95% of the starting material is evaporated and the resulting compost is recycled back to nature. 3 Easy Steps to determine Which Model is right for me? Self-Contained units are installed directly in the bathroom. Central units have a conventional looking toilet in the bathroom and a separate composting unit. They are available in two styles - low water flush and A/F waterless. Select an electric composting toilet if you have a standard electricity supply. These units feature high quality fans and thermostatically controlled heaters. Select these if you have no power or are using alternative energy. These toilets feature a higher capacity ventilation stack. Select the AC/DC Kit if you require the option of operating in a standard electric mode (115 Volt) or with only a 12 Volt 1.4 fan or with no power at all. Select a toilet based on the right capacity for your needs. Although advertised capacities can be doubled for short periods, selecting a toilet with the maximum number of users in mind in recommended. Sun-Mar offers units with capacities ranging from 1 adult to 6 adults (or a family of 8). Sun-Mar Mobile is designed for use on boats and RVs. It eliminates the need for pump outs. The Mobile is engineered to accommodate motion with mounting brackets, a sealed finishing drawer and fold up footrest. The Mobile includes an air filtration kit for odor-free deck level venting on boats. Using roughly one pint of water per flush, this porcelain ultra low flush toilet provides the look of conventional toilet with minimizing water usage. Several toilets can be installed to a single Centrex unit. Where additional height is required for the toilet to gravity feed to the composting unit, a low profile Model 511 is offered. Available in white or bone (shown) colors. 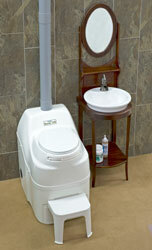 The A/F waterless toilet offers features similar to a conventional toilet. 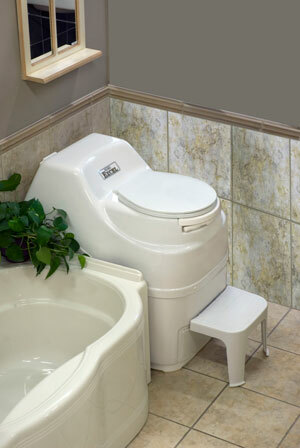 Available in white (shown) or bone colors and regular sized seat, this toilet is used with a Centrex 2000 or Centrex 3000 unit configured for waterless use. Centrex A/F toilets are connected directly above a Centrex unit. Sun-Mar units are designed for easy installation! View and download a Sun-Mar Composting Toilet Brochure here (more information and specifications inside). 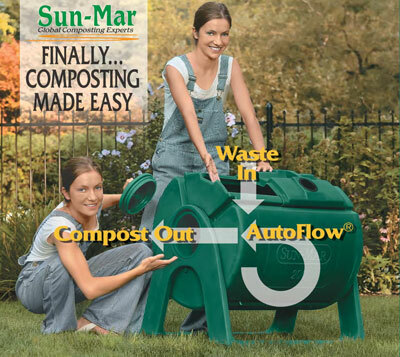 The SUN-MAR 200 is a continuous composter with a 6 bushel (50 gal.) capacity, excellent for composting kitchen scraps and a few cut up garden trimmings. The SUN-MAR 400 is a continuous composter with an 11 bushel (100 gal.) capacity (almost twice the size of the 200), excellent for composting kitchen scraps and cut-up materials from small gardens. A SUN-MAR Garden Composter is a gardener’s dream. You know that by recycling you are doing the right thing, and it’s fun to produce your own compost effortlessly. Keep the compost moist and oxygenated. This means rotating the drum regularly to add oxygen, and adding water when the compost gets dry. Aim for the right carbon/nitrogen ratio. Adding a mixture of kitchen and regular yard waste is effective, but for better, faster results, add carbon-rich material (browns) like sawdust, straw, dry leaves, or wood chips. These balance the nitrogen-rich green material and kitchen waste. Chop up the waste if possible: the smaller it is, the faster the breakdown process. This is not usually a concern because the compost in the drum and the drum’s insulating properties keep the heat in. If you use only kitchen waste, you may need to add bulking material or pre-composted material to help with oxygen penetration as the drum rotates. 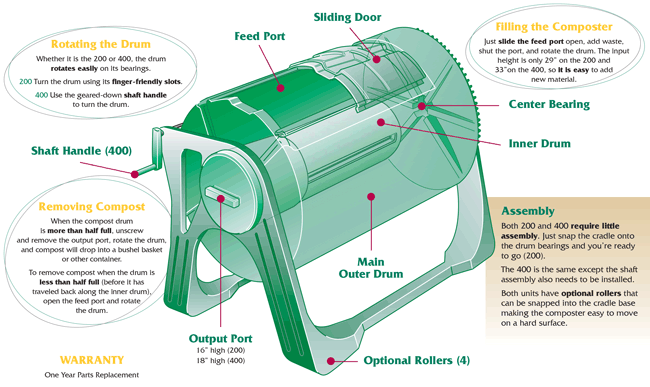 View and download a Sun-Mar Garden Composter Brochure here. 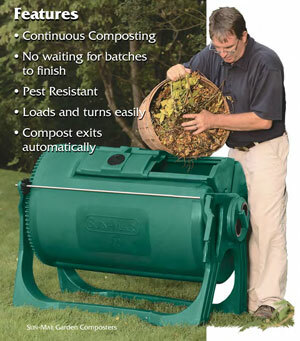 View and download a brochure for Sun-Mar Garden Composter Accessories here.